Gold miners have to smelt their gold in order to remove impurities resulting in pure gold. Most large scale gold miners send their ore to smelters with large equipment for the smelting process. Small scale miners still can do their own smelting using specialized kilns . Many people confuse gold smelting with melting. Whereas gold melting is simply heating gold to turn into a liquid form before forming gold bars, smelting is a more complex process that involves the removal of impurities from gold using heat, pressure and a number of chemicals. The smelting of gold is not a new process. According to ancient literature, gold smelting has being used as early as 6000 BC. According to most sources, the smelting was in use in the early days of the ancient towns in Mesopotamia such as Babylon in what is now Syria. The Greek philosopher Heraclitus also extensively wrote about gold smelting during the Greek civilization. A lot of other materials from several other places across the world such as Egypt, China, parts of Asia and Africa have also shown that gold smelting was done thousands of years ago. During the early days of human civilization gold ore was dug out from the ground, crushed using simple tools, then the ore washed in water and then the recovered gold smelted in earthen kilns. The same process used today (with a few improvement) that has come with this same available technology. The first step in gold smelting involves processing the gold ore. The ore containing gold once mined from the earth is processed by separating gold minerals from the crude matter holding the ore together. The gold ore is then pulverized using pressure to create very fine particles. These fine particles are then heated in a furnace to temperatures above 1064 degrees Celsius the melting point of gold. The heating process burns most of the impurities but some like other metal elements remain. Mercury is dangerous to our health when in gaseous form. Gold recovered from the ore by the Merrill-Crowe process or by the elecrowinning method is likely to contain traces of mercury. To remove these traces of mercury from the gold you must heat it in a retort. The Amalgamation Process that employed mercury in the recovery of gold from the ore is no longer used at most major mines, but gold-rich ore often has some traces of mercury that may still stick to gold even after the precipitation and the leaching process. If not removed from the ore this mercury is likely to under volatilization during the smelting process and can cause serious health and environmental problems. Iron in the gold ore can be oxidized with the Nitre and this can corrode your smelting pot increasing the smelting cost and in other cases may cause leaks which can be catastrophic and result in huge losses. The iron in the gold ore can be removed by the oxidation of the iron by use of either a forced air oven or nitric acid. The iron oxide may then be removed from the gold materials to be smelted and thus reducing the problems that may be caused by their oxidation inside the smelter. Once the raw ore has been processed the next step of the gold smelting process involves the use of chemicals to remove impurities from gold. At this stage, most of the impurities in the gold material are traces of other metal elements. Gold can easily be purified at this stage by using chemicals such as potassium cyanide or mercury. The two chemicals mostly are often used in gold purification because they make gold elements to coagulate together forming gold nuggets and clumps. This way they are easily separated from other materials. Once the gold has been purified it is put into the furnace one last time so that it is melted in readiness for it to be mold into ingots. Before gold is sold it is usually made in form of gold bars of various sizes and shapes. These are what are referred to as ingots. Finished gold can then be used to make a number of items such as jewelry and other electrical components. Sometimes items made from the gold ingots may be recycled so that they are made into different items. Gold from such sources must undergo another smelting process to remove impurities before it is used to make a new item. Smelting is not always the final stage in gold extraction. Depending on the intended use of the gold, it may have to be refined before being put to use. Refining gold is simply the process of removing the finer impurities that the smelting process could not remove. This is a chlorination process that refines gold to a purity of about 99.5%. The process involves blowing chlorine bubbles through molten gold which reacts with metallic impurities forming a chloride slag that is separate from pure gold and floats on top. Gold produced here is then cast into bars ready for the market. For higher purity of gold, the Wohlwill method is used. The method produces the gold purity of as high as 99.999%. This is an electrolytic process that uses pure gold as the cathode and Chloroauric acid as the electrolyte. When an electric current is passed through the setup, gold is dissolved at the anode and while pure gold is deposited on the cathode. The other metal impurities in the gold being refined forms either a soluble chloride or an insoluble chloride slime that is easily removed. This method is more popular with the industrial refining of gold when compared to other gold refining processes. This is a relatively new method for refining gold. The method as the name suggests refines gold by separating it from other metal elements using an electrolytic cell set up. The electrolytic cell is set up in such a way that when an electric current is passed through, all the other metallic elements dissolve except platinum and gold. The process produces gold of up 99.5% purity. A repeat of the process may further improve the purity of gold produced by this method. Gold smelting is an important process in the production of gold. It enables gold miners to separate impurity materials from pure gold that is desirable in the market. 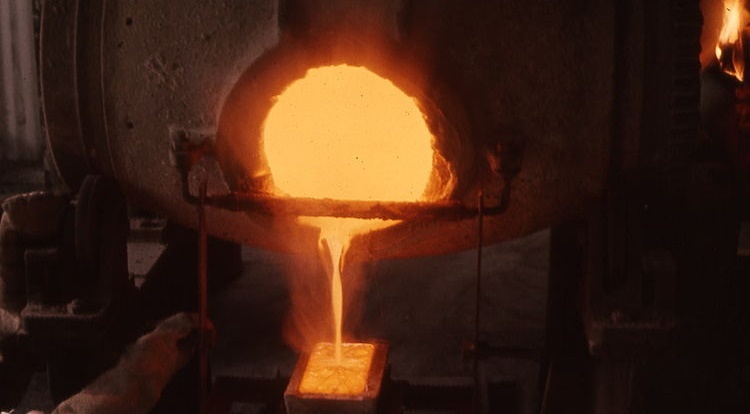 Smelting often produces gold to the purity over 90%. To improve the quality of the gold mined, gold miners have to refine the gold. This process takes the smelted gold and using a number of methods removes the often difficult to remove metallic elements from the gold thus improving its final purity. The purest gold can be refined is about 99.999% and can only be achieved by use of the Wohlwill process.